As a resident of Alaska, I am well aware of the destructive power of a large earthquake. Along with many other Alaskans, I have experienced a 7.9 magnitude quake. There are still many here who remember what it was like to live through the Good Friday Earthquake of 1964. That 9.2 magnitude quake devastated South Central Alaska. 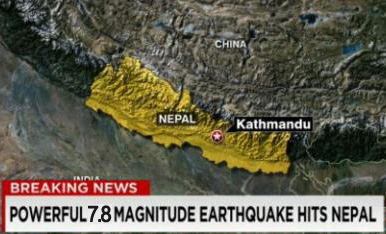 There are many organizations that are gearing up to offer assistance to the people of Nepal. If you are so inclined, find one that you are comfortable with and help send some relief. This entry was posted on Tuesday, April 28th, 2015 at 5:33 AM	and tagged with earthquake, nepal, relief effots and posted in public service announcement. You can follow any responses to this entry through the RSS 2.0 feed.